Besides our Mexican restaurant and my hair salon, also gone were the dry cleaner where Mike takes his clothes, the nail salon that I go to as an occasional treat, the UPS store that has my Georgia niece and nephew's address stored in their computer, our Hallmark store, our Subway and a few other stores. 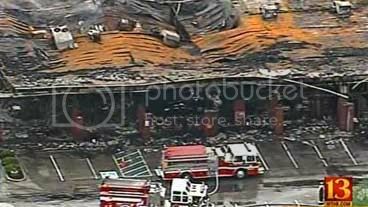 Early Tuesday morning lightening struck El Rodeo and fire spread through the entire plaza, taking Allure with it. Don't worry we have a recovery plan. We have a salon we are going to work at until we are back on our feet. We do need your help with reloading your appointments. Please email me a list of all your appointments so we can get back on track. We will not be working today Tues June 22, to get things in order. If you have an appointment today please email me so I can reschedule you for this week. YES THIS WEEK! Although this is a horrible event we will NOT let this get the best of us. We will update you with our temporary location as soon as we work all the details out this today. Please pass this on to anyone you know that visits Allure, in case we don't have their email. The kids and I drove to the scene later that morning. Yellow police tape marked off the area and firefighters were still on their ladders, putting out hot spots. The crowd gathered was a mix of rubberneckers (including me) and owners/employees of the businesses that had been busy just the day before. But true to Melissa's pledge, Allure Salon carried on. 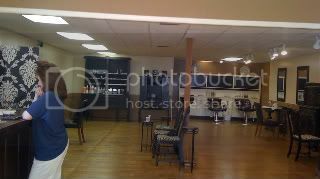 By Thursday of that week -- just two days after the fire -- they were serving clients in borrowed space at another salon. And today, an incredible two weeks later, Allure opened its temporary digs on Main Street in Zionsville. 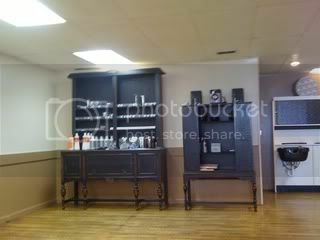 I just so happened to have an appointment scheduled for today and was curious to see what the new shop would look like. More remarkable than the fact that they were re-opened two weeks after the salon burned down was how upbeat and positive the entire staff was. Shana, who cut my hair in the wake of my stylist leaving suddenly last week, said everyone pitched in and worked long hours to clean, paint and outfit the new space. There was a bit of an air of urgency as Melissa was trying to track down a truck carrying furniture and other equipment. There was a little fumbling with paper appointment books -- the computers will be back up by next week. But there was still the amazing head massage. The offer of a beverage when I arrived. It was still a treat for me to let the gals at Allure whisk me away from my day for an hour or so. Wow! These guys are real professionals. Love them! I'm sure they'll be back on their feet in no time. Wow! That is WILD! 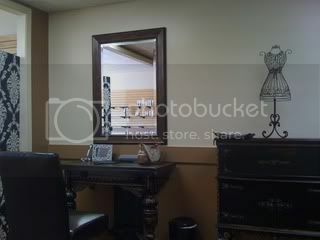 But how incredible that the folks at your salon were back serving their clients so quickly. That really says something about their fortitude and integrity! Nice reporting and nice way to tell the story! I remember that fire. I had eaten at that El Rodeo many times. I suppose it was a blessing that it happened in the middle of the night when there weren't shops filled with employees and customers. Glad to hear Allure handled a crisis with such grace and dedication. owner, my cousin melis. job well done. very proud and amazed with the fast turn around. good for them. way to stay positive. Hey Melissa's cousin, you should be proud of her! I hope someone does an update soon of how the other businesses are faring, what their rebuild plans are and what they are doing in the meantime.